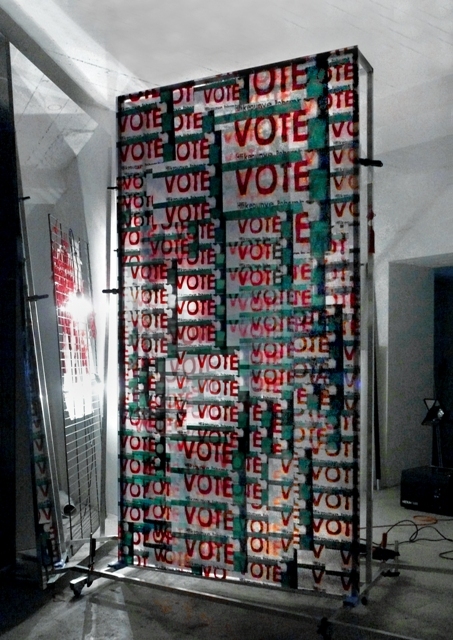 Vote/Vote is a presentation of work conceived for the Forum für Fotografie exhibition space; with this exhibition Harald Fuchs returns to Schönhauser Straße, where he showed his media installation Hybrid-Kontroverse in 2008. With this new work Fuchs presents his artistic position on a complex of themes connected to Africa. After 19 research trips the artist is a specialist perceptive to the cultural and social upheavals of the continent and lets his travel experiences and observations of the socio-cultural and political changes influence his artistic reflections. 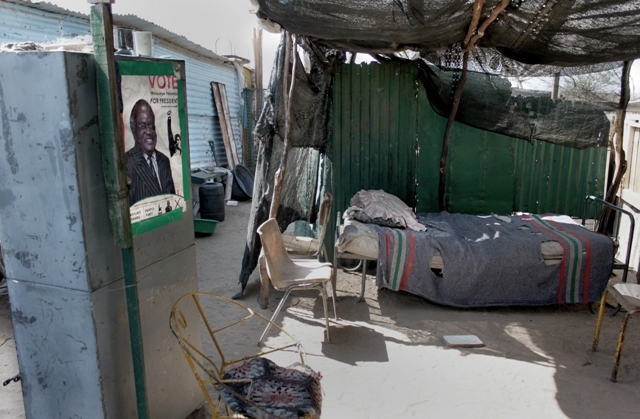 At the same time, he distances himself from documentary photography approaches or direct political statements. 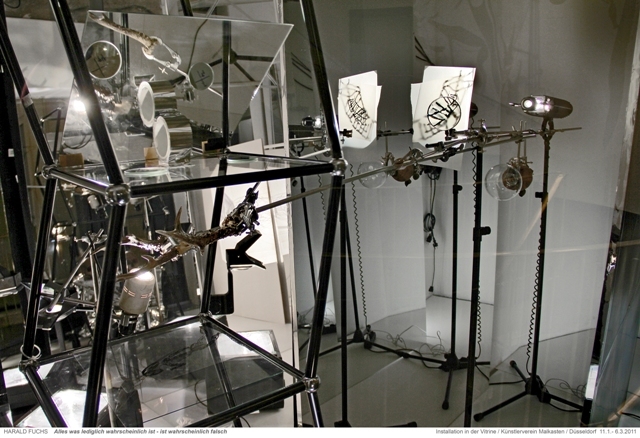 His staging of materials presents itself as a visual theater of disparate objects and photo fragments, as transparent overlays of collage-space designed from the light of the overhead and video projectors and flowing, communicating motifs and media. The object and photo artist demonstrates with his ars combinatoria a conflict between images and things. From the divergence of visibility and reproduction various possibilities of meaning and interpretations spring from a fascinating bridging of ideas on a search for new insights. 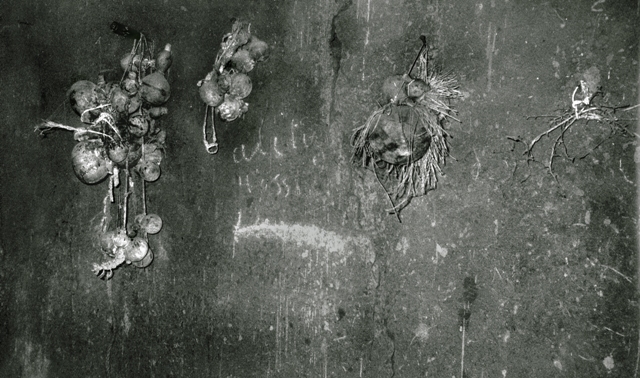 Fuchs is not a documentary photographer; he makes use of facts only as a starting material and stylistic device, and interrupts its uniqueness within the multi-dimensionality of the overall artistic conception. What remains is an echo of authenticity that permeates the spatial structure of the kaleidoscopically fragmented complex of motifs. Thus the 15-minute film, which was shot from a moving car while driving through Rwanda’s capital Kigali, is an attempt to “scan” the captured raw reality in its obvious self-manifested banality over flowing highways, skyscrapers, suburbs, and confused crowds and let them collide with the Rwandan genocide of 1994 as imagined by the viewer. The events of that time are called up only by a kind of disturbance of the image stream, which is slowed and cross-faded by Dürer’s engraving Cain kills Abel and the corresponding biblical quotation. As a counterpoint to this filmically viewed everyday reality is the seemingly unreal interior of one of the many memorials to the genocide Fuchs visited in Rwanda. 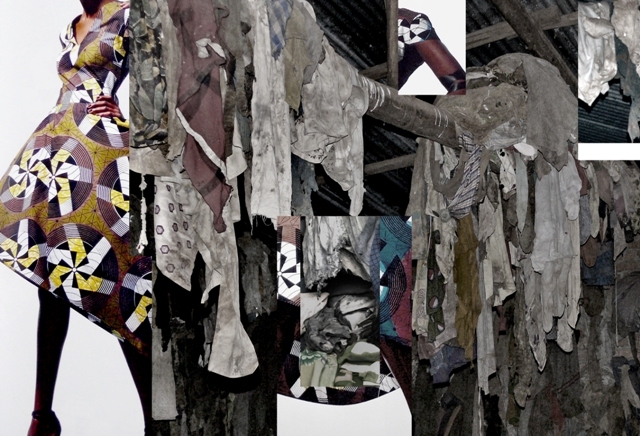 The clothing of victims suspended from the ceiling in one of these memorials was photographed by Fuchs, collaged in a kind of compressed patchwork, and, in following the strategy of dealing with different levels of perception, it is combined with images of contemporary African textile advertising. These images pick up the theme of traditional clothing and inherited patterns and color motifs and thus connote the problems of identity and belonging to different ethnic groups. 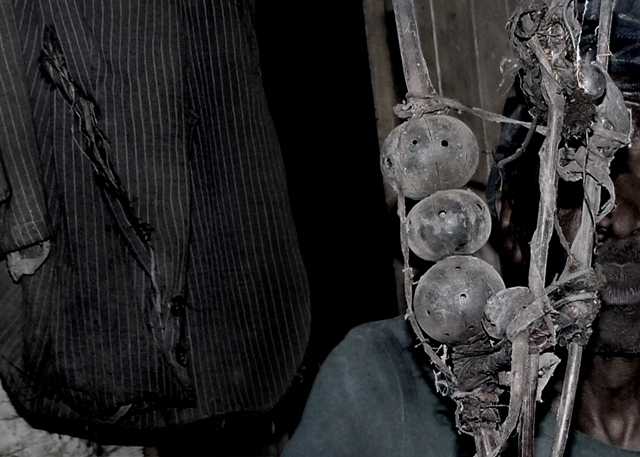 How does contemporary Rwanda deal with its historical heritage? Can it free itself of its ghosts? Can the dancelike movement of the superimposed fashion shoot be understood as an act of liberation from the oppressive sea of clothing from the dead, or will the lively youthful figure be lost in this maze? 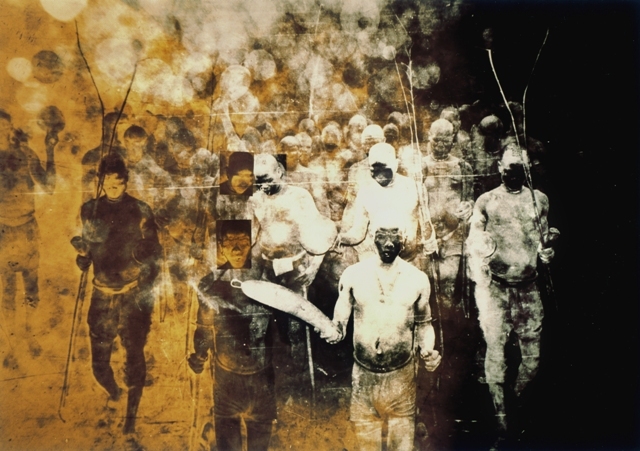 The projection of a ritual scene from a tribal ceremony (Die wiedergefundene Fremdheit/Zeremonie [The recovered strangeness/ceremony]), which Fuchs was allowed to attend and which recurs in his work as a leitmotif, conjures up as a ghostly looking positive-negative collage the transition between the living world and that of the dead. Combined with the objet trouvé, a crutch-ladder, the scenery gets further possible levels of meaning. The perpetuation of archaic customs and modes of thought are hinted at, clinging to traditional myths and belief systems mediated through shamanistic rites, which in many ways still permeate and influence the social structures today. A continent of change and modernity, on the one hand, but also a continent of seemingly intractable socio-political contradictions of social conflicts on the other hand, is marked by political stagnation and lost motion. 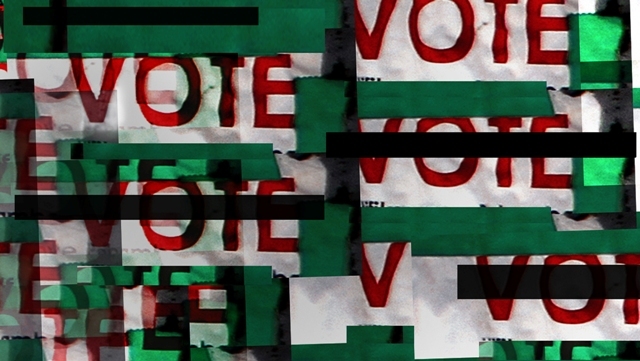 Is Vote/Vote a necessary platitude for stagnation, corruption, and political betrayal? The problematic situation of a country like Nigeria is also a representative part of Fuchs’s three-dimensional collage; an oil-rich country where the majority of the country’s population is systematically on the losing side. But Fuchs formulates no obvious social criticism here; rather he tries to make it possible for the architecture of complementary and associative structures to be experienced in object-assemblages and spatial constellations. Consequently the photographic moment is integrated in a delicate reference system of counter-references, whose proportional tension is a direct spatial experience for the viewer. The experience of the artist is haptically and visually presented to the viewer as a reflection space for contemplation and interaction. 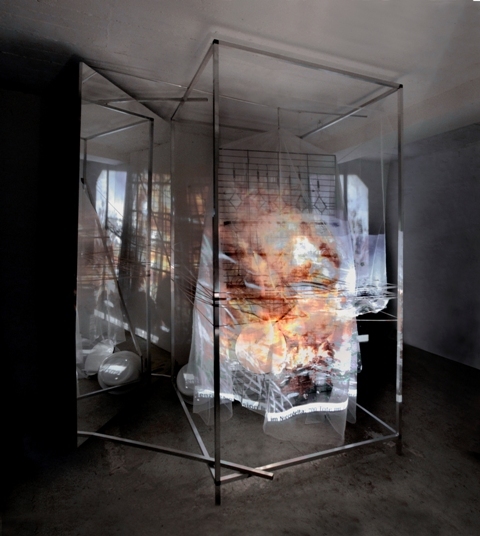 Projections, diaphanies, and the merging of the disparate re-engage the viewer to the associative development of Fuchs’s cryptic messages, which do not allow final conclusions; rather they invite the viewer to bring opposing parallel worlds in alignment. Through a sensitive engagement with primarily unfamiliar and abstract phenomena of our everyday lives and with an originality in their artistic development Fuchs takes on a singular position in the art world, from which he can achieve an interruption, abstraction, and deconstruction of our viewing habits that are accustomed to the usual flow of images. 1. Harald Fuchs quoted from: Das Paradoxe von Schrödingers Katze: Harald Fuchs – Installationen und Zeichnungen, Stiftung Museum Schloss Moyland, 2007. Catalog p 48. Harald Fuchs, born in 1954 in Rehau/Oberfranken, studied Graphic Design at the Fachhochschule Würzburg (1974-1978) as well as Graphic Arts at the Akademie der Bildenden Künste Stuttgart with Prof. Rudolf Schoofs (1978-1982). Between 1992 and 1995, Fuchs served as a Professor of Visual Communication and Mixed Media at the University of Applied Sciences Augsburg and since 1995 at the University of Applied Sciences Düsseldorf (Visual Communication and Mixed Media). Fuchs was honored with the “Hermann Claasen Award for Photography and Media Art” (1997) and the “Culture Prize of the City of Rehau” (2003). For many years he has designed light, photo, and video installations in theaters, as well as for permanent exhibitions in museums, galleries, and other public buildings. Since 1981, he has traveled no less than 19 times to Africa on research trips to cities and villages, and to places of worship and traditional medicine men. Harald Fuchs lives and works in Cologne and Düsseldorf.